Tim Dalton at Tintmaster's Newtown premises. Tintmaster has more than 15 years of experience in the window-tinting industry. Tintmaster has been so successful it had to move to larger confines in Newtown. “All our tinters have at least eight years of experience. We tint all cars and specialise in European cars,” Tim Dalton says. 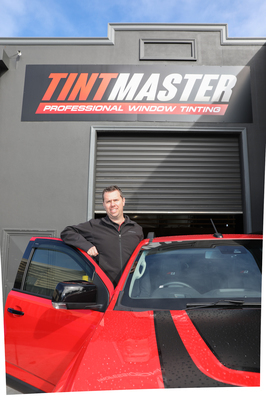 Tintmaster isn’t all about cars – its range of services also extends to home and commercial window applications. “I have one guy that all he does is house and commercial tinting,” Tim says. “So he is very specialised and is very knowledgeable in finding what tint is going to suit your house. “Whether the customer is after privacy, heat protection, UV protection to stop fading of furnishings or just wants to cut out light. Tim says the benefits of window tinting are immense. “Tinting can offer heat protection, UV protection, privacy and security, and there are particular films that can keep the heat in a house during winter,” he explains. Customer service is paramount to Tintmaster’s mantra, Tim says. “Reputation in this line of work is everything – the majority of our work comes from recommendations so it is essential that customers are happy with our work,” he says. Tintmaster is at 21 West Fyans St, Newtown. Check out tintmaster.com.au.